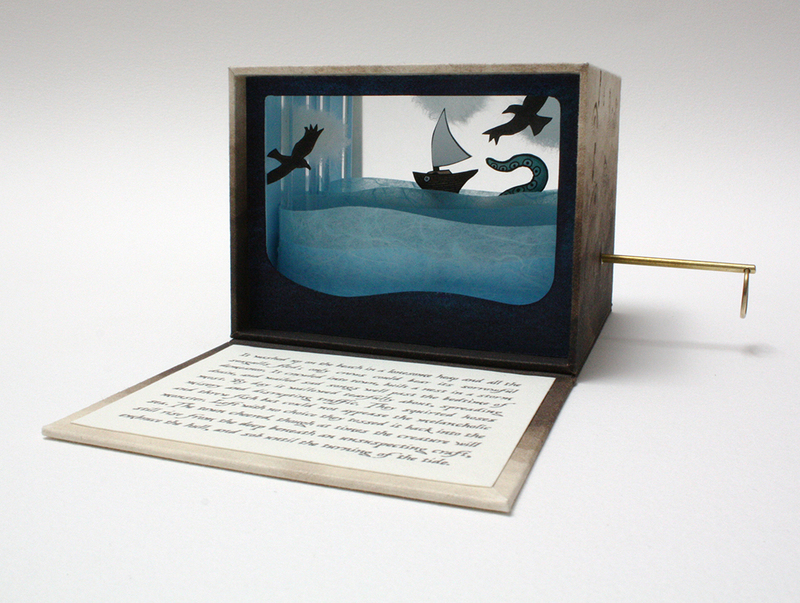 Bryan Kring is an Oakland-based book artist and graphic designer. His enchanting images and dark humored writing are often enhanced with interactive mechanisms that pull you into another world held in the palm of your hand. I visited him in the studio to see more of his work in person and ask him about his process. When I was in my early 20's I was floundering around and looking for some kind or work that would be satisfying and I ended up in a few architecture classes. When I found that I was more interested in, and better at, drawing trees and grass and stones than drafting building plans then I knew that is what I wanted to do. I wanted to find a way to get paid to zone out and draw little repetitive marks on paper. I have been trying ever since to make that happen. The creature in this tale washes ashore like a force of doom, bringing tragedy and despair to the people of a small coastal town. 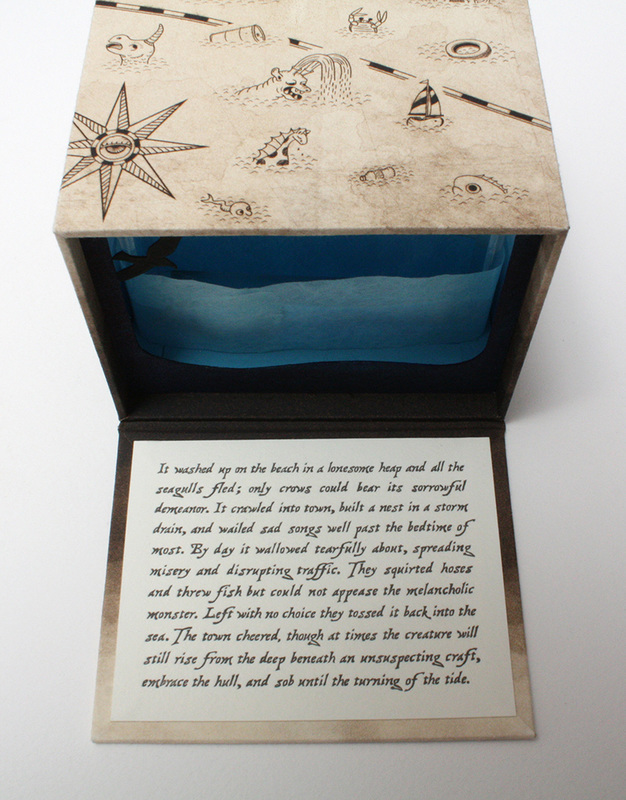 The map covering the box is an intaglio print. 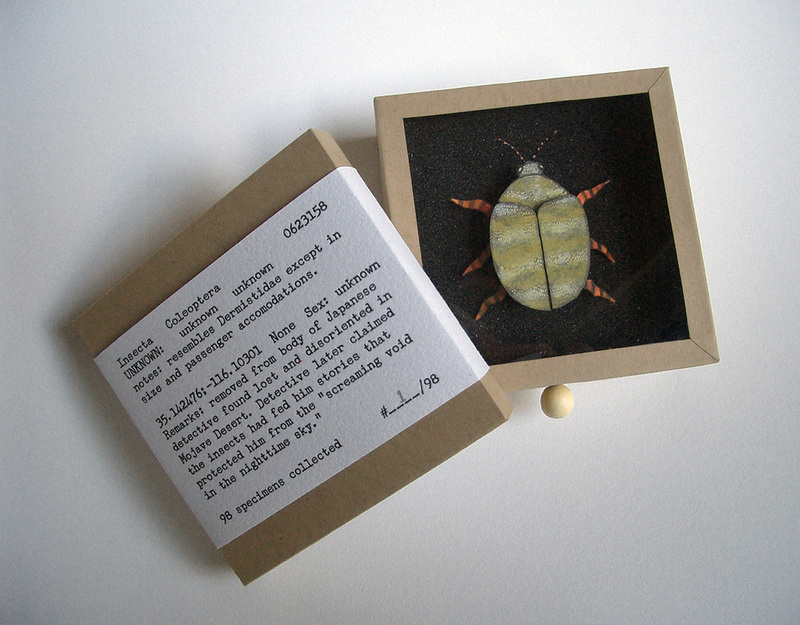 The text was printed on a letterpress as were the diorama elements which were then painted with water color. When the brass ring is pulled, the waves move, the sailboat rocks, and the arm of the monster rises threateningly. You mentioned that you used to do large-scale paintings, but have since moved into book arts. Talk to me about that transition- was it an immediate switch to paper or did you do much experimentation? I was in a constant transition for many years. I was always jumping from medium to medium and bouncing in and out of various styles and subject matter. I actually thought that it was a problem because it went on for a very long time. I thought that I might not ever settle down and wouldn't be able to develop anything consistent. I would find a new medium and get very excited as I began to explore it. But then over time I would get bored and something new would catch my eye. I started with writing stories and then moved to drawing. I played around with various types of painting, tried watercolor and acrylic. I went from painting figures to plein air landscapes to various abstract directions. At that time the paintings got large because the paintings that I saw in the museums that seemed the most powerful were all large. After that, partially out of practical concerns for space but also just from restlessness, I got into etching. Etching led to letterpress and letterpress led to book arts. 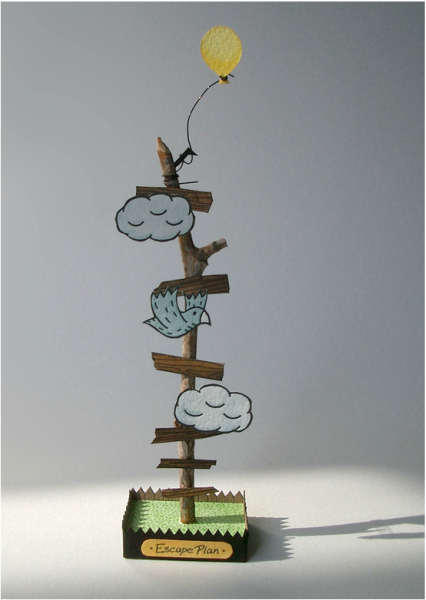 When I finally came to the book arts I found a way to combine everything I'd done before. I could work with narratives and painting and printmaking and mechanical 3-dimensional constructions. It was all a gradual transition and looking back on it now it seems like each step was preparation for a different piece of what I later would put all together in what I am doing now. "...simple forms of technology have a certain charm that is lost in more modern forms..."
Was it difficult to reestablish your workspace and accumulate new tools like your letterpress? Not really. I got lucky and found this great studio and everything I need fits in. Some of the characters in your books are explorers; many of them wear special diving-type suits. Can you talk about your motivation behind your adventurous narratives? I like adventure and so I put it into my work. I see things usually from an inward perspective and an outward perspective. So with the diving suits, outwardly they are just cool mechanical cyborg like suits that allow the person inside to venture into a hostile environment. Looking inwardly I see the suits as a sort of metaphor for the barriers that we put up to protect ourselves from various emotional or spiritual threats. I am working on a current piece that has a boy floating in a bubble. That is the same sort of thing. When/why did you start to get into boxes with moving parts. What introduced you to the mechanics you have been using lately in your boxes like Sea Monster & Lunae Secutor? I have always liked mechanical things. I like working on motorcycles and cars and fixing broken toys or appliances. With the books, I just enjoy figuring out a mechanism that will allow the movement that I want. It is always a challenge because it not only has to move correctly but it has to be durable and has to be something that can be built with my limited tools. So far everything has been built with paper, wood, screws, or soldered brass. 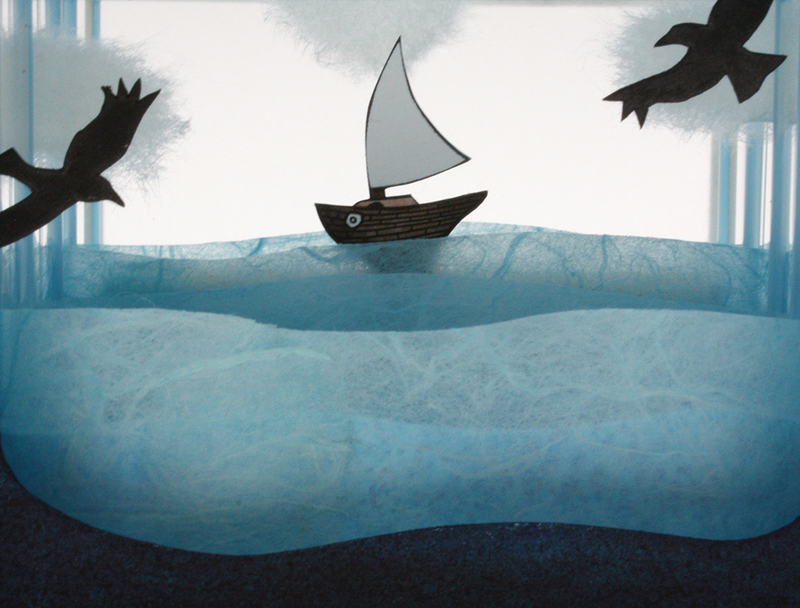 A short tale of romance and adventure below the sea unfolds in a continuous illustration running across the front and back of this accordion fold book. You use machinery like the letterpress, a machine that has not changed much since it was created. You also made a version of a Thaumatrope in addition to your interest in mechanisms. What is it about these 19th century techniques and technologies that excite you? I guess I appreciate that technology because I can understand it. If I understood how my computer was working then I might also find its motherboard beautiful, but a metal pulley turning a gear that rotates a crankshaft and puts ink on a plate and presses it onto paper. That is a process I can see and understand. I also think that simple forms of technology have a certain charm that is lost in more modern forms. 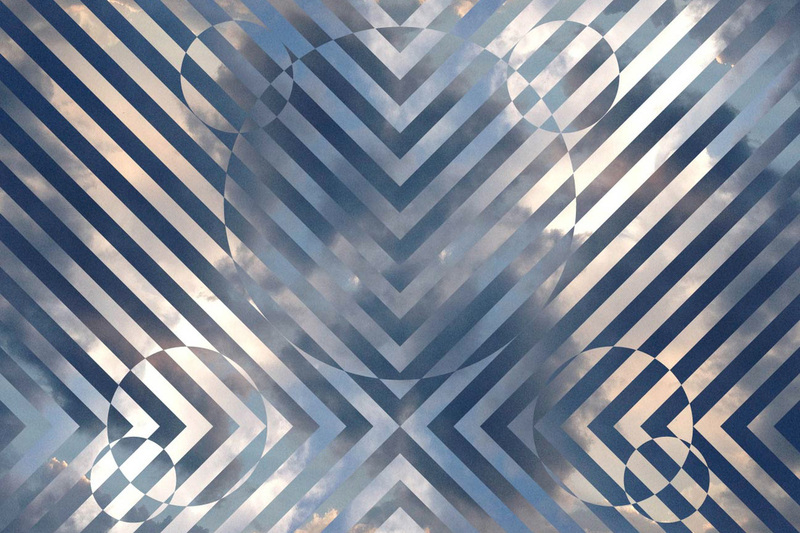 Current technology is dazzling. When I see one of these newer televisions my jaw drops open and I am amazed at the clarity and detail, so much so that it overwhelms the content. But when you see something made with some pre-film technology, like a series of images rotating on a carousel, then I can understand it and approach it without being knocked out by the technology. Somehow this ties into the reason I make small things now. I want them to be approachable and I like that you can hold them in your hands and relate to them on a personal level. I am not trying to blast your socks off with power. Do people react differently to your boxes with mechanisms than your two-dimensional works? The interactive mechanisms definitely draw people in. When someone has to turn a crank or pull on a lever they are already connecting with the piece. 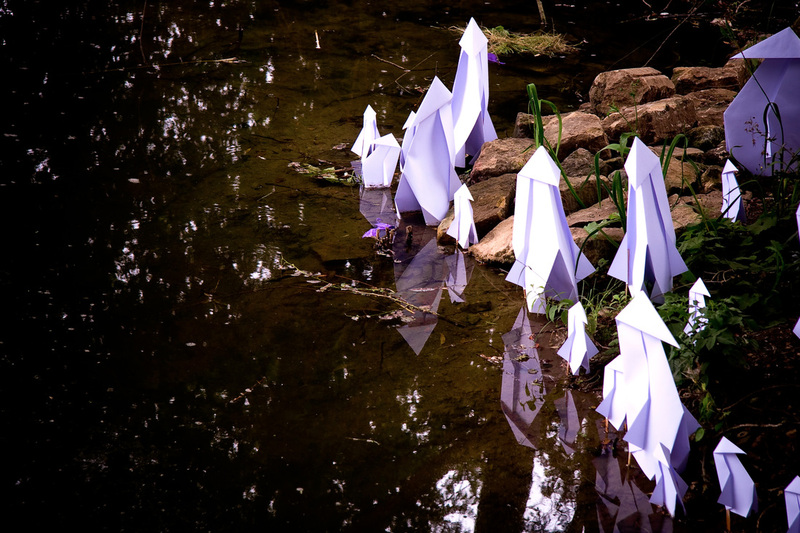 It has become an extension of their own movement and brings the piece to life. Making multiples seems to be an inescapable part of your process. How do you plan to make 100 of something? I do make a prototype for each piece. It is a time consuming process but that is the fun part. In making the prototype I work out all the details of the piece, how it will look and operate. I also decide how I will build the full edition, figuring out what will be printed, what will be hand painted, what steps I will need to go through to assemble it. I also work out the story. This is the fun part because it is the creative part where you can be surprised by the different directions it takes. When I am developing a new piece then I always have some fun challenge to think about. Once the first prototype is completed then it is a matter of production for the rest of the pieces. They are all heavy on handwork and craft, which I enjoy as well, but the real fun is in watching the initial development. It seems like cutting out a hundred tiny balloons would get pretty monotonous. Do you enjoy repetitive work? I do and I don' t. When I put on the headphones and sit down and do it then I find that I enjoy it. But at the same time, when I see that pile of balloons waiting for me to tie strings on them, or a pile of wings waiting to be cut out then I can find an endless array of other things to do instead. ﻿Where have you been looking for inspiration lately? Any books, movies, music, artists, podcasts, etc, that have been driving or informing your work? ﻿The films of Wes Anderson are a limitless source of inspiration. The way that Amanda Blake can tell a story with a title and painting is inspiring. The low-tech rawness of Daniel Johnston songs inspires me. The animation, Hedgehog in the Fog, the street theatre of Royal De Luxe. I also find inspiration from Internet research. When I am looking up a topic or image of something I'll get lost following tangents and often discover something cool and unexpected. During our studio visit you mentioned the desert was also big source of inspiration for you. “The Lunae Secutor (moon chaser) is one of the few species of caterpillars that do not metamorphose into winged adults, instead completing their pupation in very much the same state as when they began. The males of the species take this perceived denial of destiny with particular difficulty, exhibiting signs of disbelief as they emerge from the cocoon followed by a display of fierce stomping which has been interpreted as anger. In subsequent days many of the males will devote themselves intensely to the courting ritual, while a few of the others will develop an apparent attraction to the light of the moon. When I am developing a new piece, the story and the illustration and the format all influence each other. 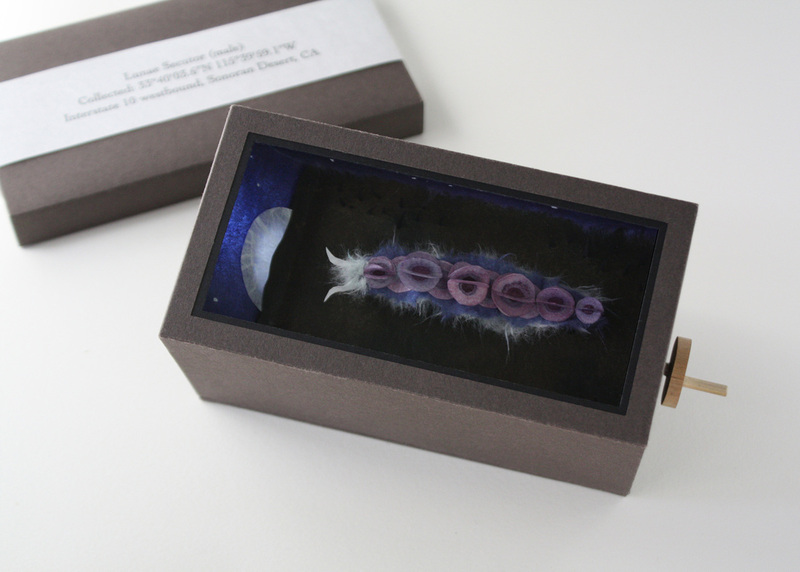 For example, in a recent piece about the caterpillar, I started out just wanting to make a moving caterpillar. So I started trying to develop the mechanism. As it came about and I saw him moving I started thinking of a story where the caterpillar is walking for some reason. So then I decide that he couldn't fly, he couldn't transform into a butterfly, so he is depressed and he walks. 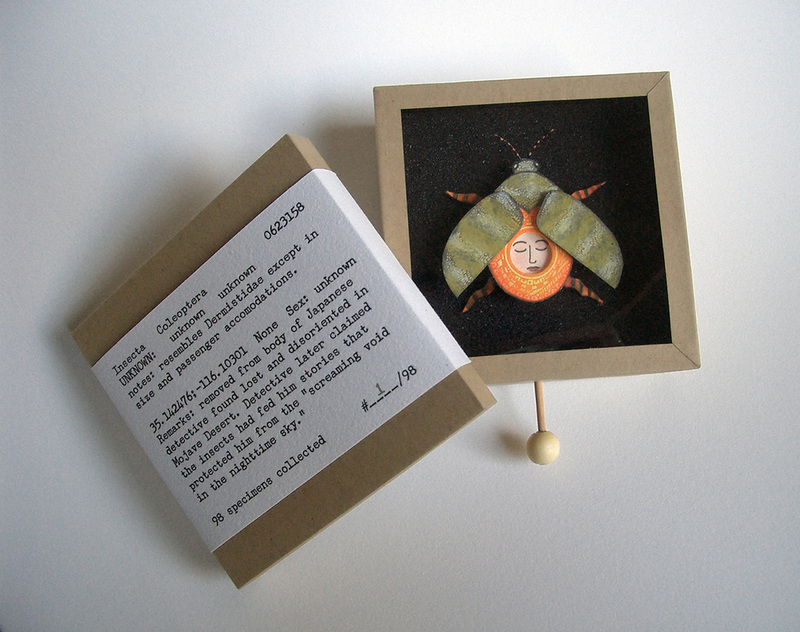 I can't remember if the story or the actual box first suggested that the caterpillar was chasing the moon but one came first and the other followed. I don't have any specific way of starting a new piece but usually have just a vague idea of a format, or an image, or even just a feeling that seems interesting to me. So I had the box and rough story to a point where I had this caterpillar chasing the moon. I wanted to put him in the desert for a few reasons. For the very general reason of my liking of the desert and the air of mystery that it gives to me, but also in constructing the box for the caterpillar I could envision it in the desert. I could see how I could make it with mountains silhouetted against a night sky and then how the ground beneath the caterpillar could be basically flat. So in this case the box form was influencing the story direction. If I had been able to envision a way to make the caterpillar on a branch in a jungle scene then I might have followed the story in that direction. But the desert was the way that it led. Then, in thinking of the ending to the story I had the idea of bird of prey, maybe an owl, swooping down and eating him in the end. But I like to mix some reality into the stories so I researched owls and I don't think they usually eat caterpillars. But I learned that some bats do. So then, I researched bats and found that the Leaf Nosed Bat are found throughout Central America and up into the Sonoran Desert. 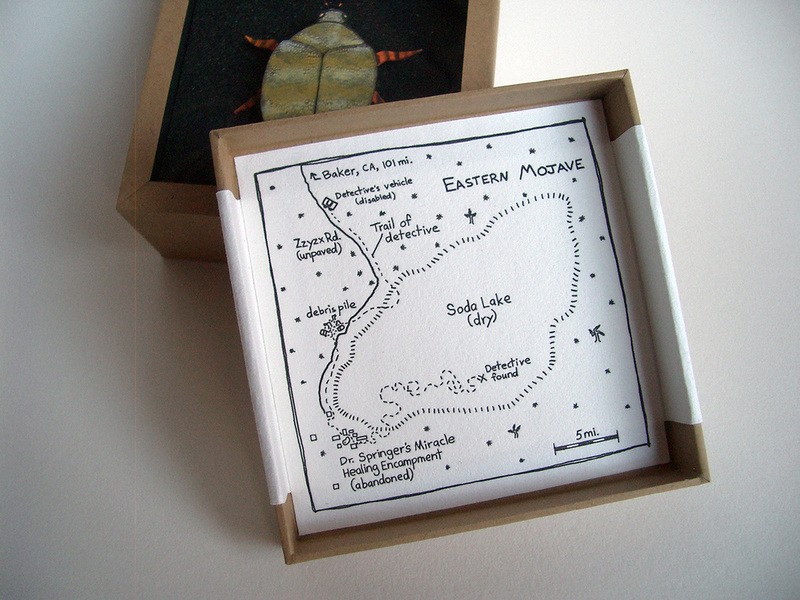 I liked the idea of the Sonoran Desert because I wanted this piece to be a sort of companion to the other insect specimen box that I made which had an insect collected in the Eastern Mojave (that location I had a personal story behind). 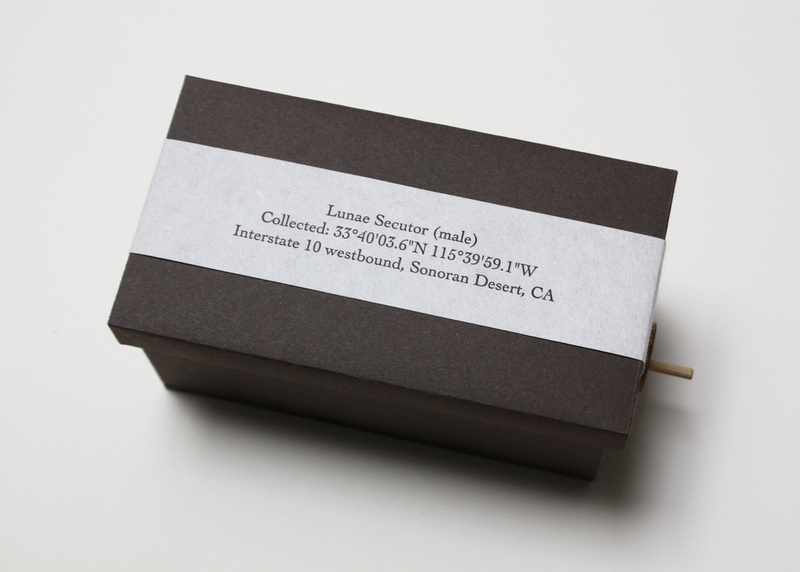 Then I wanted to have a standard specimen label that lists the coordinates of its collection on it. Well, the story of this caterpillar can be read in a few different ways. One of the ways is as a tale of mid life disillusion: a sort of a midlife crisis when you realize that you are not going to be all that you might have dreamed. When this caterpillar is faced with that realization it takes to the road in search of some greater meaning. So, I decided to place the location of its collection on the westbound lane of Interstate 10, which cuts through the Sonoran Desert. I liked the image of the caterpillar traveling the highway west, chasing the moon, and heading for Los Angeles maybe. So then I looked on Google maps for a very desolate location on the 10, noted the coordinates and that was it. As you can see, I put a lot of thought into tiny details and connections that probably nobody will ever understand. I know that I would not get all of these connections if I were looking at this piece (if it wasn't mine). But that is how I write the stories and I enjoy learning about the owls and bats and locations and whatever I come across as the stories develop. That is why I listed the Internet as a source of inspiration for me. It makes researching so easy and also lends itself to making interesting connections and jumping from one topic to another. Your work has some dark humor and elements of sadness. Can you speak about where the mood of your work comes from? It's just what comes out. With the stories, I don't consciously direct the stories, and enjoy writing them because I get to watch them unfold. I do sort of guide them along and force them back when hitting a dead end, but I am pretty much just along for the ride. Their mood and themes probably say a lot about me but I don't analyze them. Because they are fictional then I can say they are just stories and avoid seeing my reflection in them too clearly.